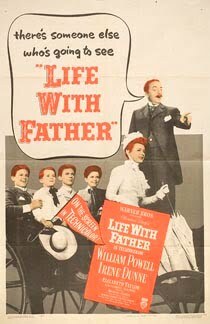 Classic Movie Man: Classic Film of the Week: "Life With Father"
Classic Film of the Week: "Life With Father"
During the late 1940s, one of the most sought-after properties was the film rights to Life With Father, the longest-running non-musical play on Broadway. The play written by Howard Lindsey and Russel Crouse, based on stories by Clarence Day, opened in 1939 and ran for seven years. The story has a relatively simple plot: a wife, after discovering her husband hasn’t been baptized, does her best to convince him he needs to, if he wants to see his family in heaven. From the earliest days of its run, Hollywood was interested in obtaining the film rights. William Powell, after seeing the play, wanted his home studio, MGM, to buy the property for him. He thought the part of Clarence Day (Father) would be the role of a lifetime. While the play was still on Broadway, sisters Lillian and Dorothy Gish both portrayed Lavinia (Mrs. Day) in out-of-town productions. Lillian, who was headlining the Chicago production, thought the role of Lavinia would be perfect for her friend, Mary Pickford. Pickford, the silent-film icon, was looking for a property to make a movie comeback. Gish advised her friend to buy the film rights, but Pickford didn’t act swiftly enough. Soon all the major studios were actively negotiating with the playwrights and members of the Day family. With all this competition, the price skyrocketed and the contract stipulations were too much for most. Warner Bros. eventually bought the rights with a down payment of $500,000 plus half of the film’s profits. 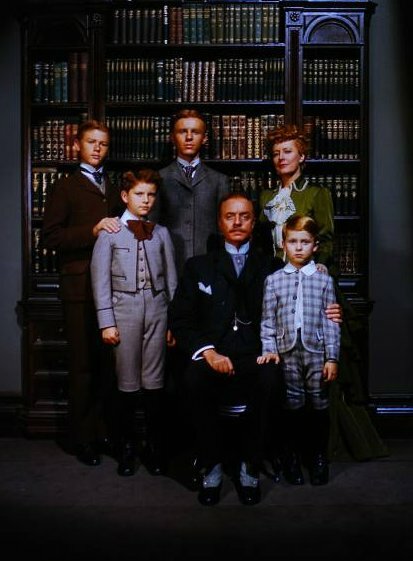 Warner Bros. thought Life With Father had the potential to be as big as Gone With The Wind , so they were willing to pay the price. When William Powell found out that Warner Bros. obtained the rights, he asked MGM to consider loaning him out for the role. They did, Warner Bros. accepted, and Powell was in. The choice of Powell to play Clarence Day proved popular with the movie-going public, but the casting of Lavinia would prove more troublesome. Bette Davis, the top female star on the Warner Bros. lot at the time, was offered the role of Lavinia Day. Davis struggled to adequately portray the character’s gentleness and decided not to take the role. Mary Pickford, who missed out on buying the film rights, was in the running. Apparently, her screen tests were good, but director Michael Curtiz (Casablanca ) didn’t think she had any box office appeal. She had, after all, been away from the screen for thirteen years. From most accounts, Curtiz wanted Irene Dunne to play Lavinia. Dunne said she had no interest in playing a woman who seemed to cry when things didn’t go her way. But Curtiz thought she would be perfect in the role. Curtiz admired Dunne’s talent as an actress, but he also wanted her because she was a top box office draw. 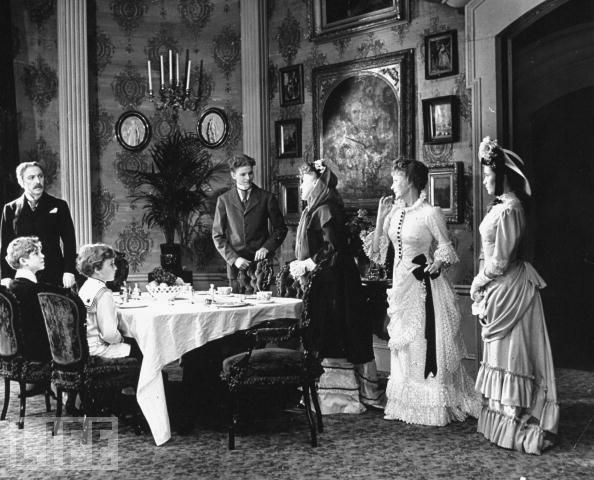 Dunne’s recent success in Anna and the King of Siam was one of the reasons the director pursued her. Curtiz kept asking Dunne to reconsider and he eventually wore her down. 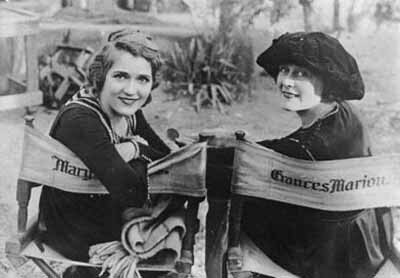 In a 1978 interview, Dunne revealed that Curtiz motivated her on the set “because I didn’t like the role very much and he had to placate me to make it more palatable.” Dunne's acceptance of the role meant there would never be a movie comeback for Mary Pickford. The supporting players were easier to find. Elizabeth Taylor, (who was barely 15 years old) was loaned out by MGM to play Mary Skinner, a role created on the stage by Teresa Wright. Zasu Pitts, Jimmy Lydon, and Edmund Gwenn rounded out the rest of the cast. Life With Father was one of Warner Bros.’s most important and costly films during the late 1940s. The set decoration and costume designs were impeccable. A huge outdoor set was built to recreate New York City’s Madison Ave. during the 1880s. 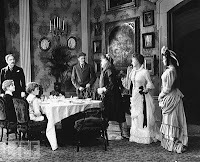 Elaborate indoor sets for Delmonico’s restaurant and McCreery’s Department Store were built, adding to the historical accuracy. The set decorators and the Warner production crew went to great lengths with even the small details. For example, there is a scene where Powell’s character takes a horse-drawn trolley to work. As he enters the trolley to sit down, you notice, in the background, advertisements inside the trolley, but only for a fraction of a second. You can argue whether that detail was necessary, but it shows the seriousness with which Warner Bros. handled the material. 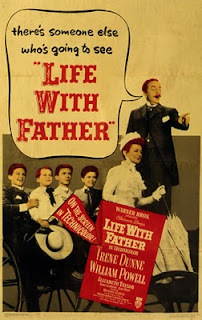 Both Irene Dunne and William Powell were major movie stars when Life With Father went into production. Dunne, never regarded as a diva, but a shrewd negotiator and business woman where her career was concerned, insisted on receiving top billing. It could be argued that, at this time, she was the bigger box office draw. Powell on the other hand had the title role, the movie was Life with Father. A compromise was struck. Fifty percent of the movie prints would give Dunne top billing and fifty percent would have Powell’s name in front of Dunne’s! This held true for the movie posters (illustrated at left and below) and publicity releases as well. Supposedly, for the New York premier, they flipped a coin to see which print would be used. 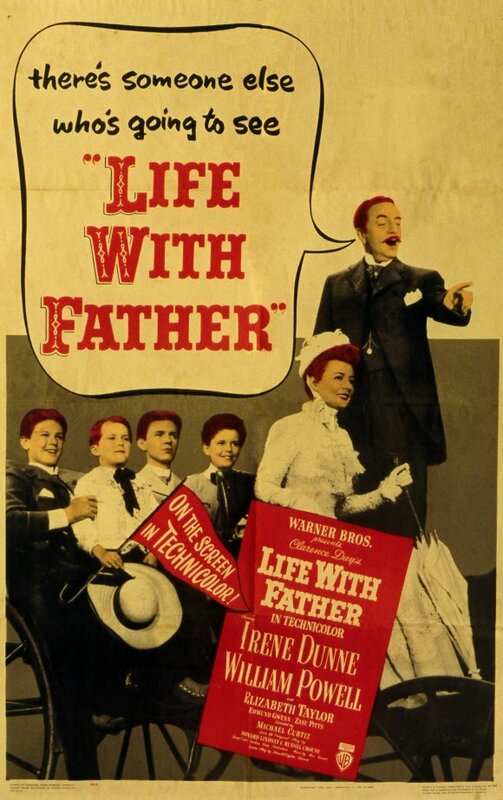 Life With Father premiered in August 1947 and was an immediate critical and financial success. Not quite the blockbuster the Warner Bros. studios had expected or hoped, but one that was profitable enough to make all the accountants happy. For Powell it did turn out to be the role of a lifetime and he received his third Best Actor Academy Award nomination (Ronald Colman won for A Double Life ). For Dunne, one of her best roles would come two years later in the George Stevens production, I Remember Mama . Due to the unusual contractual arrangements between Warner Bros. and Lindsay and Crouse, the movie, after its initial release and re-release in 1948, pretty much vanished into obscurity. And for reasons not known to this writer, it fell into the public domain. Since Life With Father went into the public domain, there have been numerous inferior prints of the movie classic. With most, the color and sound are inferior. One can hope that someday a restored version will be available so modern viewers can see this wonderful American classic the way audiences did in 1947.